New discovery: Netherlands Indies 5 gulden 1942 without specimen overprint and perforation, by Rob huisman, 24 May 2011. Recently I was contacted by a British couple for an appraisal of a 5 gulden note from the Netherlands Indies, dated 1942. They were tidying up their loft and found the note that the husband got around 1958 from his uncle, who served in the British navy during World War II. The note was stored for more than 50 years. Initially they wanted to throw it away but then decided to browse the internet for possible information. Luckily they ended up on my website and subsequently contacted me. I provided them with background information about the note and after some e-mail exchange they decided to sell the note to me. “During my research, I discovered an article written by P. J. Soetens (former archivist of De Nederlandsche Bank, the Dutch central bank) about unissued De Javasche Bank notes during the same period that could very well explain the origin of this 10-cent proof note. According to Soetens’ article, the German invasion of the Netherlands in May 1940 broke the colony’s relationship with Joh. Enschedé en Zonen, its traditional banknote supplier in the mother country. 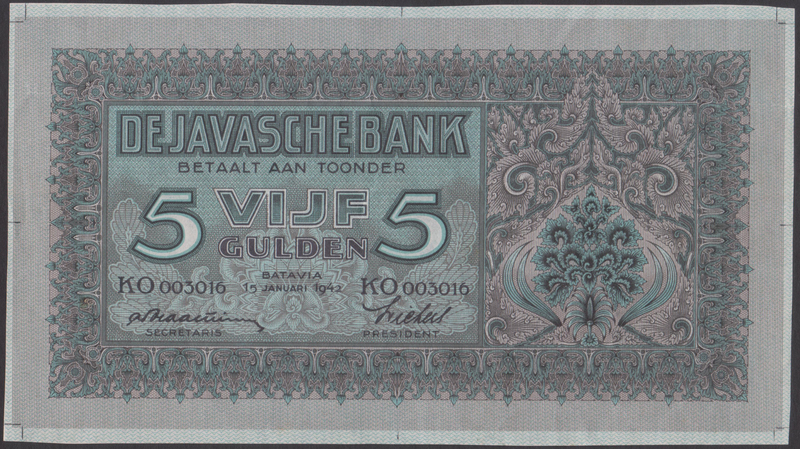 In order to meet the demand for Netherlands Indies paper money, De Javasche Bank requested the printing company of N.V. Kolff’s Offsetdrukkerij in Batavia (now Jakarta) to design a new series of notes in denominations of 5, 10, 25, 50, and 100 gulden. Johannes-Wouterus Donkers, operations manager at this printing factory, developed a design for the 5-gulden note. Soetens’ article mentions that together with the bundle of 500 proof notes, a few sheets were saved and transferred to “De Javasche Bank”. Until now I had never seen evidence of these sheets and I always (implicitly) believed these sheets were printed notes mend for actual circulation. This recently obtained note was not properly cut, but obviously cut out from a sheet; the cutting marks are still clearly visible. This proves that indeed a sheet was saved from destruction. The most remarkable thing is that this note carries the same serial number as the 500 proof notes, letting me to believe that the mentioned sheets were either not meant for circulation but for producing more proof notes or there are still also sheets out there that were indeed meant for circulation. Furthermore, it will be interesting to find out how this cut-out note ended up in the possession of a British sailor, although it was expected to be kept safe in “De Javasche Bank” vault. More information about this remarkable find soon….